Perhaps one of the best examples of a self made man in real-estate development and mid-century modernism is Joseph Eichler. He had a dream, a clear vision and made this dream a reality by going against all odds in creating entire communities around the Bay area and Los Angeles of affordable, sleek architectural designed homes for the middle class Americans. Single-handedly, he started a bold, visionary endeavor, one that is still being admired and cultivated to this day. Eichler was a competitve man by nature, bearing his background in the tough minded atmosphere of America’s financial capital. Born in 1900 and raised amid traditional Jewish circumstances, his family was not rich considering the modest income his father had owning a small toy store in New York. 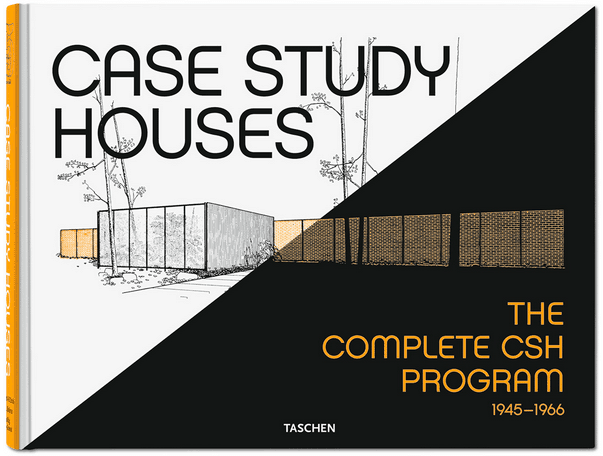 However modest his upbringing, Joseph Eichler’s education was efficient and practical. He graduated and earned a business degree from New York University and started a career on Wall Street. This helped him prepare for a mainstream career. When Eichler met his wife he found a kindred spirit who was perhaps more outspoken in enveloping modern life. The relationship later on contributed and fueled Joe’s confidence in his own creative quests. His wife Lillian was also a descendant of European ancestry, the daughter of Polish Jews and a first-generation American. Encouraged by his wife Lillian’s mutual enthusiasm, he became captivated by modern architecture. In 1925, Joe and Lillian moved to the Bay Area. The company Joseph was working for was the most prominent butter-and-egg wholesaler in the region. Joe took up the job of chief financial officer for the business on the West Coast. For twenty years Joseph Eichler excelled in his job, and the family thrived, despite the depression and World War II. 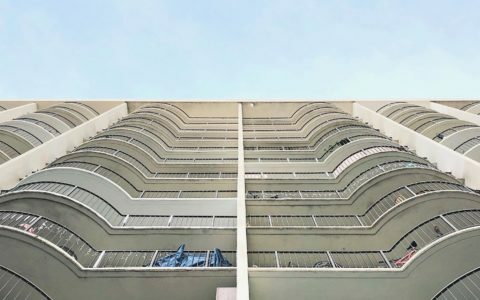 Eichler would leave his job abruptly during the war, and his family would go through a period of instability, changing residences several times in a few years. In 1943, prior to these events, Eichler came across a unique possibility for his family, and rented Frank Lloyd Wright’s Bazett House. 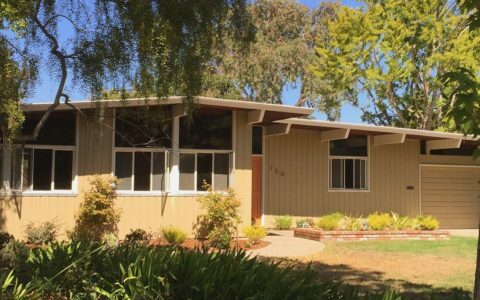 After living two years in this house, Eichler’s spirit was moved enough to allow him to feel his own inner turbulence for creative self-expression. Eichler once said: “I began to dream of building homes for sale that would incorporate some of the same advantages I enjoyed in my own house.” Eichler learned by this experience what others have since concluded–that Frank Lloyd Wright’s genius for design often achieved its most profound effect in his small residences (the so called Usonian Houses), where his singular attention to function and detail were so complete and so deftly handled as to transform everyday life into art. 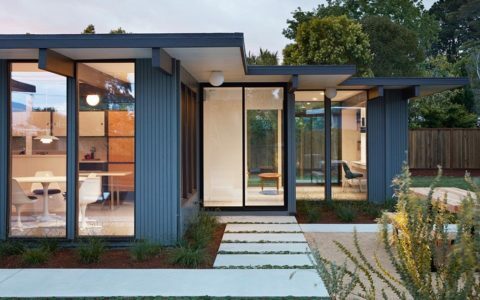 Eichler entered the house development business in small steps. He started as an investor, and after learning about the business, in 1947, he launched his own home-building business: the Sunnyvale Building Company. Prefabricated homes for buyers already owning a lot. In 1949 Eichler hired architects Anshen and Allen to design his family house, and in 1950, he commissioned their firm to also design prototypes for five of his subdivisions: Sunnyvale Manor Addition in Sunnyvale, El Centro Gardens, Greer Park, and Green Gables in Palo Alto, and Atherwood in Redwood City. 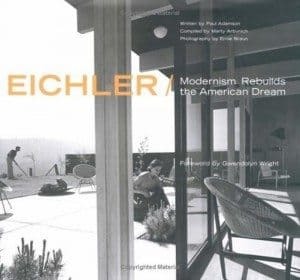 Soon the press began to call Eichler one of the nation’s leading home developers and by 1954 Eichler Homes had built already 1,800 modern houses. And so began the extraordinary career of Joseph Eichler and his dream of building America’s Modernism era.